Globalization has brought together otherwise disparate communities with distinctive and often conflicting ways of viewing the world. Yet even as these phenomena have exposed the culturally specific character of the academic theories used to understand them, most responses to this ethnocentricity fall back on the same parochial vocabulary they critique. Against those who insist our thinking must return always to the dominant terms of Euro-American modernity, Leigh Jenco argues—and more importantly, demonstrates—that methods for understanding cultural others can take theoretical guidance from those very bodies of thought typically excluded by political and social theory. Changing Referents thus proposes an exciting new solution to longstanding and pervasive issues of cross-cultural understanding. Jenco examines a decades-long Chinese conversation over “Western Learning,” starting in the mid-nineteenth century, which subjected methods of learning from difference to unprecedented scrutiny and development. Just as Chinese thinkers argued for the possibility of their producing knowledge along “Western” lines rather than “Chinese” ones, so too, Jenco argues, might we come to see foreign knowledge as a theoretical resource—that is, as a body of knowledge which formulates methods of argument, goals of inquiry, and criteria of evidence that may be generalizable to other places and times. Arguing by example, Jenco amplifies the call of reformers such as Liang Qichao and Yan Fu to bianfa—literally to “change the institutions” of their society in order to produce new kinds of knowledge, implying as well “changing the referents” that those institutions sought to emulate, and from which participants draw their self-understanding. In doing so, these Chinese thinkers point us beyond the mere acknowledgement of cultural difference toward reform of the social, institutional and disciplinary spaces in which the production of knowledge takes place. Leigh Jenco is Associate Professor of Political Theory at the London School of Economics. Her work at the intersection of contemporary political philosophy and the intellectual history of modern China has been published in the American Political Science Review, Political Theory, and the Journal of Asian Studies. She has taught and conducted research in Singapore, China, Taiwan and the US and is also the author of Making the Political: Founding and Action in the Political Theory of Zhang Shizhao (Cambridge University Press, 2010). 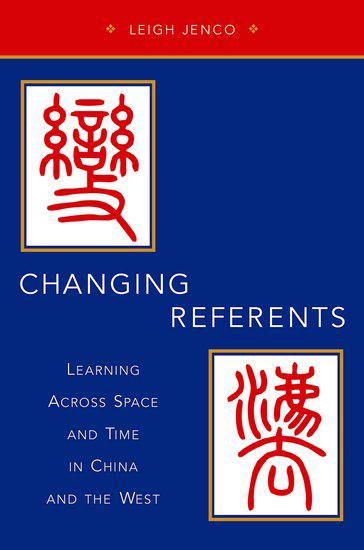 For more information on changing referents, please see the Oxford University Press website.